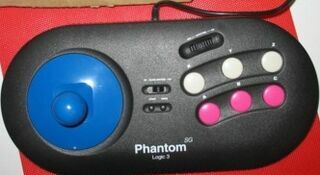 The Phantom SG Six is a third-party control pad manufactured by Logic3 for the Sega Mega Drive and Sega Master System. It is a six-button controller with a joystick, and has turbo/slow options. As the Master System has no button, the "slow" feature does not work in Master System games.